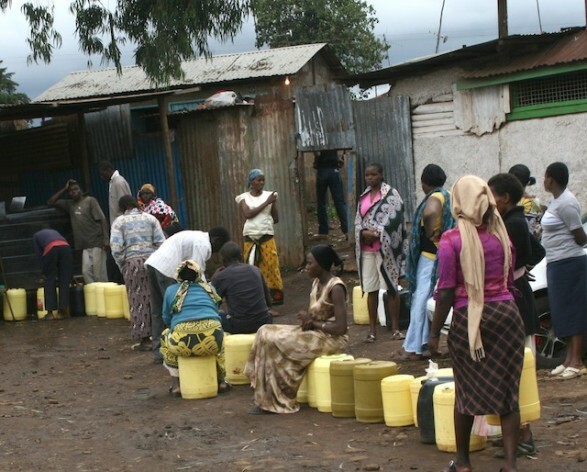 NAIROBI, Sep 11 2012 (IPS) - Water scarcity is fuelling deadly inter-ethnic wars that continue to claim lives in Kenya, according to government officials. And if nothing is done to educate communities on how to conserve the valuable resource, the situation will escalate, governance experts and environmentalists warn. On Sunday, Sep. 9, 38 people were killed in revenge attacks in the Tana River Delta district of Kenya’s Coast province. The deceased include eight children, five women, 16 men, and nine police officers. The incident occurred as the government announced it would conduct a disarmament exercise in the Tana River Delta following clashes over water and pasture that have left more than 80 people dead. Coast province police boss Aggrey Adoli told IPS that about 500 raiders from the Pokomo ethnic group attacked the Kilelengwani village, in Tana River Delta, and torched a police camp and several other structures at dawn. On Monday, Sep. 10 the area was inaccessible and police officers were flown in by helicopter to quell the violence. “This was in retaliation to Thursday’s incident in which 13 Pokomos were killed when raiders from the Orma (ethnic group) struck the Tarassa village in the area,” Adoli said. The attacks are in retaliation to an Aug. 22 incident over water and resources that resulted in the death of 52 people, including 11 children and 31 women. The attack occurred after cattle owned by the Orma ethnic group strayed onto farmlands belonging to the neighbouring Pokomo community and destroyed their crops. Both communities have a long history of conflict over resources. But conflict over resources is not confined to this region. Also on Aug. 22, four people were killed in a separate incident in Muradellow village in Mandera North, in North Eastern province. Police said that the conflict occurred at a water point where herders had taken their animals. In March, 22 people were killed in Mandera, in North Eastern. More than 1,500 people fled their homes as a result of the violence, which occurred in El Golicha village, close to Kenya’s border with Somalia. North Eastern provincial officer Ernest Munyi, who is also the region’s assistant commissioner of police, told IPS that the attacks were becoming more frequent. “Clan attacks are common in the region, which has now been witnessing clashes every month since February. The attacks were often sporadic, targeting members of other clans but usually arise from resource competition. “These are nomadic pastoralists who depend on livestock for survival. They rustle livestock and fight over water and the few grazing fields,” he said. Political leaders, human rights activists and environmentalists are calling on the government to address the problem urgently. Mwalimu Mati, the chief executive of Mars Group, an NGO that deals with governance, told IPS that the government must provide equitable resources to end the clashes. “Resource conflict will be with us for a long (time) because the government policies that promote timber harvesting have resulted in deforestation,” said Mati, who is also a lawyer. Scanty forest cover has resulted in the reduced rainfall here, according to water experts. Peter Mangich, the director of water services at the Ministry of Water and Irrigation, told IPS that due to the effects of climate change, the country now only received one quarter of its previous rainfall. “The average annual rainfall is 630 millimeters, which should be four times this figure to be enough. The National Development Plan 2002 to 2008 recognises Kenya as a water-scarce country where the water demand exceeds renewable freshwater sources,” he said. “Our depleting natural water resources, due to inadequate rainfall and scanty forest cover that stands at three percent, are the problem. The country’s water basins do not reach an equitable area of the country,” he said. And it is the reason for the increased conflict, according to Dr. Bernard Rop, a former Commissioner of Mines, a geologist and environmentalist. “As a result of the skewed water distribution between the country’s water basins and within the basins, water use conflicts arise out of demand of water for irrigation, livestock, wildlife and environmental conservation,” Rop told IPS. “There have been clashes over water and grazing fields in most parts of North Eastern, Turkana, Samburu and Pokot in the Rift Valley and the Coast regions for the last 10 years, resulting in the death of 400 people and the theft of 10,000 livestock,” he said. Mati pointed out that conflict over resources would spread to other parts of the country that were not water scarce. “Conflict will not only be in dry areas. Climate change is real and even countries that share the River Nile are quarrelling over it. Let the government adopt other means to solve this problem,” he said. Mati explained the need for water had resulted in Tanzania, Uganda, Kenya, Ethiopia, South Sudan and Sudan calling for the revocation of a 1959 treaty, brokered by the United Kingdom, that gave Egypt, and to a lesser extent Sudan, historical rights to the river’s resources. Rop said that Kenya had water readily available, it just had to be tapped. “This country produces 290 megawatts of geothermal energy, the leading in Africa. It has a lot of underground water. If this water is tapped and distributed to the affected areas, conflict will end,” he said. Mangich said that the government is addressing the problem. “Since last year, we have partnered with NGOs like World Vision to sink boreholes in the affected areas so that residents can have enough water for their livestock and domestic use. We also encourage them to use the water to grow vegetables and maize to complement livestock keeping,” he said. But Mati said that nomadic pastoralists should be encouraged to engage in other economic activities that are more vialable and suggested that the government encourage urbanisation. “This will allow many people to live in towns that have social amenities and to farm on land as a group, not as individuals,” he said. Kenya’s Minister of Educatoin Mutula Kilonzo told IPS that the government needed to implement existing policies regarding access to water. “The new constitution has very good policies to cater for the dry regions by sinking boreholes and promoting irrigation. Let us implement laws that deal with agriculture and the clashes will end,” he said. San Bernardino is already fighting a water war with Orange County, no News at 11, media Blackouts?